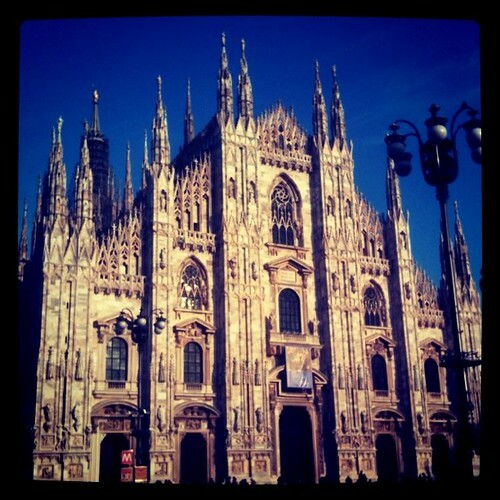 I climbed the Duomo...you know, the huge, monstrous, gothic cathedral in the heart of Milan. It never gets old, every time you set foot in the piazza, the sheer amazement you feel looking at this church. After the Duomo, tried out the Luini's Panzerotti shop. Holy cow! It's like a Bella's breadstick stuffed with pizza sauce and mozzarella! Yum! And, finally, a stop at the SuperPolo grocery store for some of my favorite and most necessary baking ingredients! So, now, a challenge! Anyone want to guess what these five cans cost here in Euros? I'll look for your guesses in the comments! Thanks to everyone who left a comment on a post a few weeks ago! Love when everyone does!